Giallo Fiorito granite is quarried in Brazil. It is a predominantly yellow stone that looks very bright and light from afar, with darker yellow areas throughout the granite. Upon closer inspection, you can see that the color of the bedrock is dark brown. This dark bedrock is intertwined with a small amount of dark brown or black minerals. The golden yellow mineral deposits are reasonably uniform in color and almost always a golden yellow. 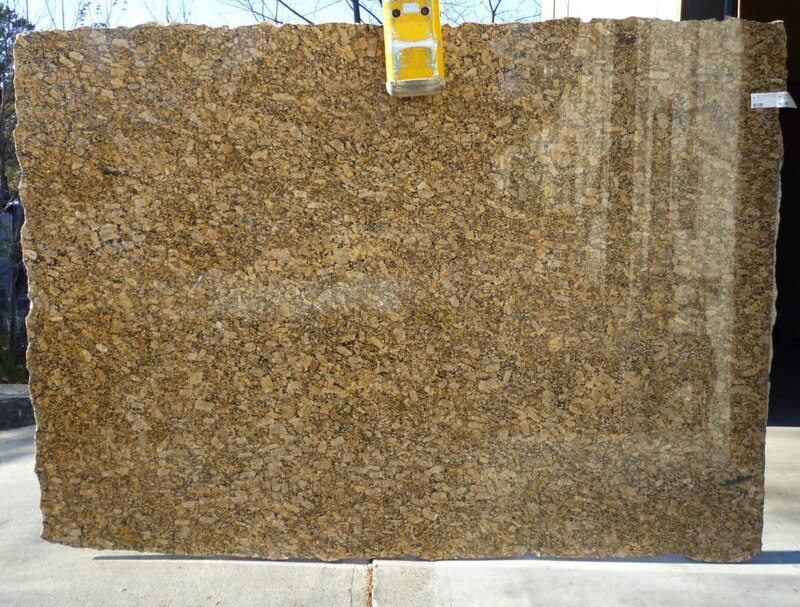 Giallo Fiorito granite has a medium level of variation. The size and density of the golden mineral deposits are what will vary the most. Some slabs will have small deposits, while others have large ones, but they will always be there. Giallo Fiorito countertops look best when combined with medium stained natural wood cabinets. Light stained cabinets can look a little washed out when paired with the golden tones of the stone. You can choose dark cabinets, but be sure you have a lot of natural light or lighting fixtures so the area is not too dark.